Biofilm/bioslime is a complex, dynamically interactive multicellular community protected within a heterogeneous exopolysaccharide matrix. Its formation results in the genesis or perpetuation of infection, enhancement of inflammation, and tissue damage or death. Industrial financial losses result from biofilm/bioslime formation; however, the consequences in the medical realm are equally devastating. General anti-infective strategies are aimed at rapidly killing planktonic forms of microorganisms without specifically targeting the sessile forms that perpetuate their planktonic brethren. The ultimate prevention of infections is to completely eradicate the reservoir sources of biofilm formation. Ozone’s molecular oxidation capabilities, effective for microdestruction, can be employed in a CIP process of a water distribution system and is the best approach against biofilm buildup and prevention of microbial colonization, the source of biofilm. While heat disinfection is costly, chemicals can leave residual and UV cannot be reliable, ozone has provided the economically lasting solution to sustain risk-free water supply system for medical operations. Quality assurance of water supply in medical environments is a critical factor to overall patient care as well as the on-site infection control. Any missteps in cleaning and disinfection procedures or improper functioning of equipment can put patients at great risks. 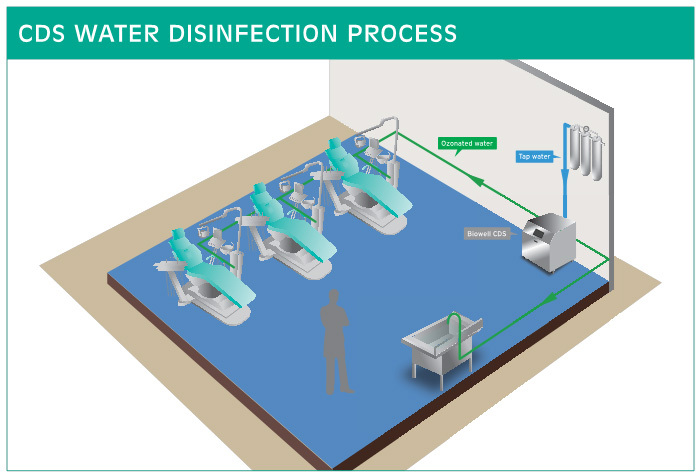 Biowell’s CDS series can be a comprehensive water disinfection program for infection control for medical facilities, eliminating chemical biocides and destroying bacteria, viruses and any other pathogenic organisms in the water supply. Biofilm, another common concern in medical water distribution systems, can be eliminated and prevented with ozone’s strong oxidation ability. Hygienically clean and safe water is maintained throughout the water distribution system for superior operation and reliability thanks to external Biowell’s CDS series! Easy to read indicator for part replacement. Simple drop-in integration with tap water distribution. Safe compatibility with existing system material and design and installation facility. Immediate and safe destruction of microorganisms without chemicals. Prevents microbial colonization and eliminates biofilm without concern of alteration of water characteristics, such as pH. Ozone (O3) is Mother Nature’s gift for safer, more effective sanitation. Ozone is the most powerful naturally occurring agent – the same element that cleanses the Earth’s atmosphere, balancing the bacteria population and neutralizing harmful chemicals. Ozone exhibits a short 20 minute half-life and it reverts to oxygen rapidly because it is simply oxygen (O2) with an extra oxygen atom. Thus it quickly kills pathogens and does not build up on surfaces the way detergents and chemicals can. In 1991, the US Environmental Production Agency (EPA) confirmed that ozone is the most effective primary disinfection available for drinking water. Ozone oxidizes bacteria cell wall and membrane, allowing water and additional ozone to enter the cell. The sudden flood of ozone (O3) and hydroxyl (OH- ) dissolved in water (H20) causes cell lysis, and as it bursts, the genetic material and enzymes are released into the ozonated water. In the ozonated water, the unleashed cell components are attacked by the ozone so that it cannot recover and no resistance is built up. 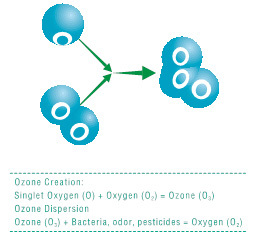 After contact with the various cell components, ozone (O3) reverts back to its stable oxygen (O2) state. Therefore, there are no residues and no final rinse required. 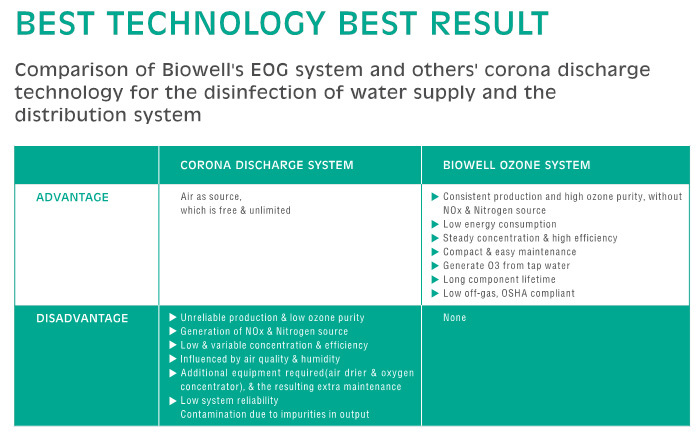 Biowell uses the world’s leading ozone generation technology, Biowell Electrolytic Ozone Generation (EOG) technology. Electricity is applied to water and produces high purity, high concentration ozone (O3) and oxygen (O2). It is unlike traditional ozone generators that use air as the source of oxygen. Biowell’s patented EOG technology generates ozone directly from tap water that is purified within a patented Pure Water System. No other substance besides water is used in the electrolysis, so only pure ozone without any harmful by-products (such as NOx) is produced. In addition, patented dissolving technology uses high-pressure nebulization to achieve superior ozone dissolution efficiency. Ozone, as an oxidizer, which can be dissolved in water, is a broad-spectrum disinfectant that is 3,000 times faster in eliminating bacteria, viruses and other pests than chlorine. High purity ozone production for safety and assured disinfection applications. 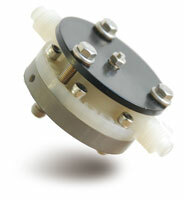 Built-in ozone destruct unit for off gas safety and compliance. No NOx production to ensure free of health hazard. No alteration to water characteristics to ensure adaptability to application and demand. Eliminates chemicals in the washdown. Eliminates chemical storage, handling and associated risks and costs. Kills microorganisms and eliminates biofilm. No THM or other harmful or unnecessary by-products that can create additional unwanted substances. Biowell’s patented EOG technology generates ozone directly from tap water that is purified within a patented Pure water System. No other substance besides water is used in the electrolysis, so only pure ozone without any harmful by-products (such as NOx) is produced. 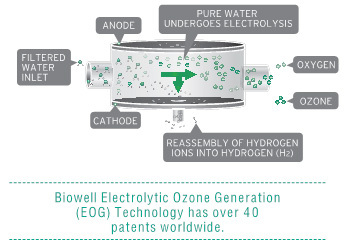 Biowell Electrolytic Ozone Generation (EOG) Technology has over 40 patents worldwide. Ozone Can Be The Solution! Ozone is the most powerful oxidizing agent that is not a chemical, and formed from oxygen through an on- site generator. 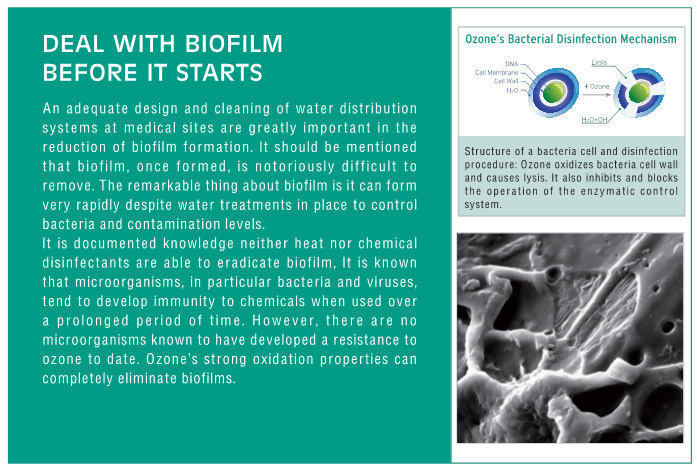 Dissolved in water, ozone will eradicate any existing microorganisms and biofilms without residual. 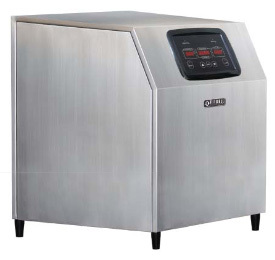 As stated by Association of Medical Instrumentation (AAMI) in 2004, ozone is the most effective means for reducing and removing biofilms to enhance qualtity assurance and safety of patient care. Chemical disinfection is the most typical method used, commonly employing chemicals such as bleach (chlorine), peracetic acid/hydrogen peroxide mixtures, and formaldehyde. The uncertainties and concerns with this method are incomplete disinfection or incomplete flush where residuals and trace chemicals remain in the system. There have been many documented reports of adverse reactions and casualty due to residual chemicals after sanitation. Most filtration systems with activated carbon remove biological contaminants along with chlorine, therefore no residual disinfection remains. This undesirable side effect of filtration systems will facilitate the growth of biofilm in the pipeline. Many problems arise in the operation due to the lack of residual disinfection after water filtration systems. Activated carbon filtration removes chlorine but leaves all water supplies prone to contamination risks. By replacing these disinfection systems with ozonated water, there is continuous disinfection throughout the whole facility. The CDS seamlessly integrates into back-room central water supply of any operation to provide point-of-use (POU) water disinfection and maintain optimal water quality through an entire facility. The system requires only municipal tap water and utilizes Biowell’s patented EOG technology for safe and efficient ozonated water production. The CDS can provide ozone sanitized water up to 3,000 litre/hr to multiple outputs, without any other external equipment, including all water taps and faucets. High purity ozone gas generated by the ozone generator is delivered to the dissolving device for dissolution in water and distributed in the supply system. Oxidation starts to take place immediately on microbes, organics, bacteria and viruses. Along the pipeline the retention time allows a sufficient contact and mixing. The pipeline is maintained free of bacteria and biofilm. Residual ozone is delivered throughout the water distribution system anytime to allow the system and pipeline are free of bacteria and biofilm. Biowell makes the application of ozone in treatment of water supply and the distribution system available and reliable for integration with any existing facility setup. Biowell’s patented EOG technology generates pure, high concentration ozone directly from municipal water purified within our ozone systems. Operation and performance is independent of operating environment factors, such as air quality and humidity, which are common causes of failure in traditional Corona Discharge Systems. (Corona Discharge is the majority type of the traditional ozone generation technology that is known to be highly dependent to the environments for reliable operations). No other substance besides water is used in the generation process. Therefore, only pure ozone is produced, free of any by-products (such as NOx) and without additional substances in the output (such as nitrogen). Any presence of nitrogen promotes microorganism’s growth, including algae, which are the main reason for system failure and a significant shortcoming in applications of medical water treatment using traditional Corona Discharge. 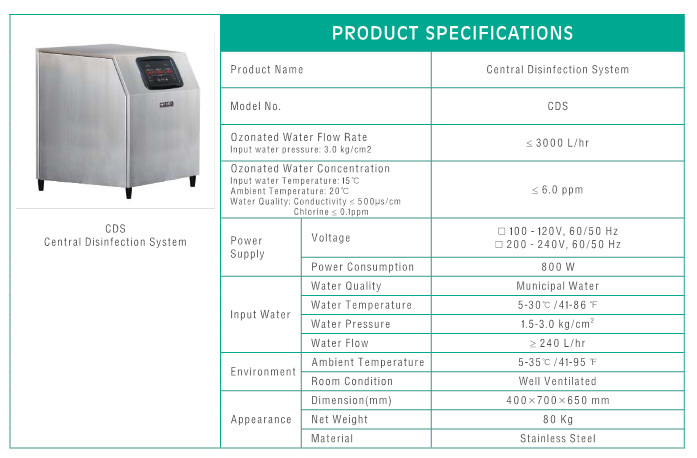 Biowell CDS Series reliable ozone production and constant dissolution performance, the treatment results are steady and consistent. Once installed, the long lifetime and reliability of the system eliminates the need for frequent maintenance and extra on-site service. Biofilm formations are a concern for medical facilities because they continuously release bacterial compounds and once formed are resistant to chemical disinfection. 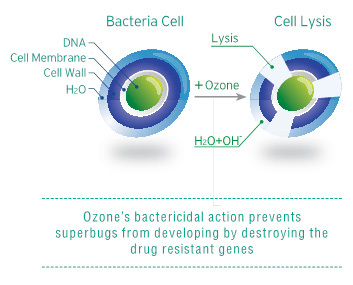 Ozone is the most effective method to destroy microorganisms and prevent biofilm. Ozone maintains a risk-free water system without the need of cleaning maintenance service. Ozone is compatible with the materials regulations and standards of a water supply and distribution system within medical facilities. The benefits of ozone surpass all other POU supply water treatment methods in every aspect. The system provides effective disinfection performance, simplified maintenance, and eliminates associated risks of ineffective and unreliable UV treatments and remaining traces of chemicals. Looking for some of our devices to be installed? © 2019 MINT DEVICES All right reserved.